Two days Bee Keeping Training for new comers. Any Indian citizen can register for the training. It is a paid training for registration. Last date of registration 11th March, 2019. · Bee Colony, Queen, Worker, Drones. 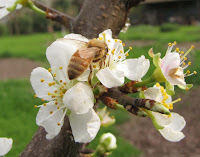 · Seasons of Flower and Crops suitable for Bee farming. · Feeding of Bees in off season. · Swarming of Bees and how to catch a Swarm. · Effects of Pesticides on Bees. · Bee Keeping Benefits, wax, honey, Pro-polish, Pollen. · Division of a colony.